"Do not come between a nazgul and his prey"
You find out the Christian God (Trinity) does exist after choking on a hot dog (or whatever you prefer) and died. What argument would you use to keep God's "wrath" and "anger" from descending on you? That I found it hard to believe in a God that had (and would act on) so much wrath and anger in the first place. None. If indeed such a fantasy came about, I would go to my man downstairs and attempt to set up a shop dedicated to research into permanent destruction of souls, which ought to be good business as weapons usually are, and/or to ruining god's paradise with whatever passes for highly toxic waste (Or something like that) there. Then I would dedicate my eternity to payback for that "wrath" and "anger". I don't think reason would work. Running, I assume that wouldn't work. 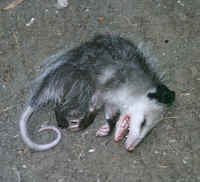 Fighting, he probably wants me to do that to justify his cruelty. I'm going with this solution. If that really happened there would be no use arguing....can't change the mind of someone who has unreasonable rules and holds all the power. It would be a big WTF moment and a time to 'pray' that those who believe hell is separation from god were right. Tant said, OP, presumably, you believe all that nonsense, so I reverse the question: what would you say when god's "wrath" and "anger" inevitably turned to you, you being a sinner and all? "Oh, forgive me, master! I regret, master! Can I lick your public-forum-acceptable euphemism for balls, master?"..? Hypotheticals such as this were part of what caused me to abandon any concept of God hating humanity. Do you see how small this makes God look - it would be like me pouring gasoline on ants just to show them how angry I was that one of them stung me. Assuming the truth of your hypothetical, there would be no argument to make. God would simply pour gasoline on the unbelievers (petrol on the British unbelievers) and light the match. If he's that angry, nothing could stop him. On the other hand, if Jesus succeeded in his mission and "took away the sin of the world," then there would be nothing for God to be angry about. All would be forgiven. I'll go ahead and choke on the hot dog, I've always loved junk food. So my choices are head out to Hell under my own steam or beg to spend eternity with a wrathful god. Well, Satan may be wrathful too but somehow that doesn't seem so bad -- it's just par for the course rather than a huge disappointment. The only thing I can imagine saying to the Xtian god is "adios". Or it could be that the South Park boys are 1/2 right and Heaven has only 4,000 people in it and everyone else is in Hell. Just the reason for it would be different. First I'd ask: what the hell is the trinity? ??? How about asking it what 5 divided by 0 equals? I admit, if I were a mainstream protestant I'd be stuck for an answer. However, I am not a mainstream protestant. I'm a Roman Catholic. So I believe I get my due. If I still have sin on my soul, but not enough to damn me, then it is purged in purgatory. 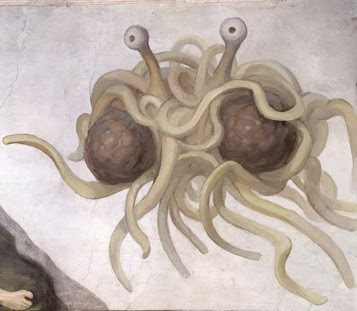 Stuff yourself on FSM noodles till you choke and die and then vomit on Gawd, who will then be consumed by the resurrected FSM? Sounds as good as any other!